Every two to seven years, the eastern tropical Pacific warms in an event known as El Niño. When meteorologists began comparing this year with the last major event in 1997, NCAR scientists performed side-by-side visualizations, and were shocked by what they saw. The 2015 El Niño is predicted to be one of the strongest in history. NCAR scientists compared this year's El Niño with the last major event in 1997. Though similar to the earlier pattern, weather effects are yet to be determined. El Niño brewing in the tropical Pacific is on track to become one of the strongest such events in recorded history. It may even warm its way past the historic 1997-98 El Niño. While it's too early to say if current warming will live up to the hype, a new US National Center for Atmospheric Research (NCAR) visualization gives a revealing glimpse into the similarities — and differences — between sea surface temperatures in the tropical Pacific in 1997 and those in 2015. Sea surface temperatures are key to gauging the strength of El Niño, which is marked by warmer-than-average waters. Even if this year's El Niño goes on to take the title for strongest recorded event, there's no guarantee that global weather impacts will be the same as they were in 1997-98. Like snowflakes, each El Niño is unique. Still, experts are pondering whether a strong El Niño might ease California's unrelenting drought, cause heat waves in Australia, cut coffee production in Uganda, or impact the food supply for Peruvian vicuñas. To better understand the comparison, Matt Rehme of NCAR's Visualization Lab created this video animation. It uses the latest data from the National Oceanic and Atmospheric Administration, which is predicting wetter than average conditions in much of the US this winter. Rehme previously created a similar visualization of the 1997-98 El Niño. 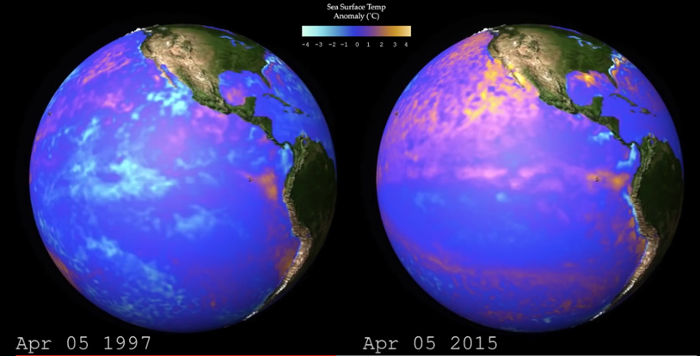 When comparisons between this year's El Niño and that event began flying around, he decided to make a second animation and compare the two. "I was a little shocked just how closely 2015 resembles 1997 visually," Rehme said. A brief comparison of changes in sea surface temperature anomalies between the major El Niño event of 1997-98 and the El Niño event emerging in 2015. The visualization depicts data from the NOAA 1/4° daily Optimum Interpolation Sea Surface Temperature (OISST). The data is combined from sources such as satellites, buoy networks, and ships. The OISST analyses are named for the key satellite sensor used: in this case, the Advanced Very High Resolution Radiometer. Courtesy NCAR.